Produktinformationen "Star Wars TIE Fighter ANH Pilot - Helm 1:1 Standard Prop Replica"
Nach Master Replicas und EFX schickt sich nun Anovos an DER Hersteller für Repliken, Helme und Kostüme zu werden. 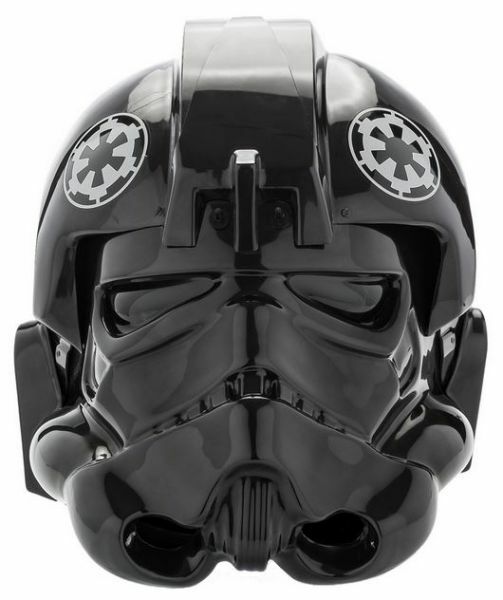 Offered for the first time on its own are the Standard Line versions of the Star Wars™ TIE Fighter Pilot Helmet. Imperial Emblem "cog" decals on forehead. Lined, breathable mesh inside of helmet for wearer's comfort. Vader Wingman Style Features: Gunmetal gray paint scheme on "teeth", chin, and forehead "mohawk". Front of forehead "mohawk" features pilot's nameplate using iconography replicated from screen-used artifact reference material. Note: The helmet included with the TIE Fighter Pilot Costume Ensemble features a built-in environmental fan system, a feature NOT found in this Standalone Helmet offering. Weiterführende Links zu "Star Wars TIE Fighter ANH Pilot - Helm 1:1 Standard Prop Replica"
Kundenbewertungen für "Star Wars TIE Fighter ANH Pilot - Helm 1:1 Standard Prop Replica"